Do you want freedom from dependence on the 9-5 Jobs Market for your income? Then you will have to develop your own source of income. You could do that either through creating a small farmstead type homestead or by creating your own online business or even by doing both. If you said yes to either or both of those questions, you may then be wondering how you get started? That's why, if you have not already joined, you are invited to register to join the "How To Live Off The Grid Now" growing online community. This is where you can quickly get information, ideas, plans and tutorials; seek advice and get answers to your own questions about getting, and living, off the grid. It is also where you can share and compare your own experiences in discussion with others as feedback to help answer and support other members in the community. Become part of this Community because together we are always stronger and more successful. Take back control over how you live your own life! Get yourself off the grid! Review the checklist below to get started and learn what it takes to do that. Note: This is just an overview; a top-level checklist of the eleven most fundamental things you would need to know if you were thinking about how to get off the grid. This is not intended to cover every possibility of all of the things that you may have to deal with. For everyone thinking about how they would get off the grid, their individual situation will involve different circumstances and criteria. Many of those circumstances will be unique to your particular personal situation and plans. It would be impossible to cover all possibilities in this quick checklist but we can cover the common, fundamental, basics. To explore, and get, more detailed answers to your questions, sign up to register to join the "How To Live Off The Grid Now" growing online community if you have not already done that. 1: Need to KISS To Get Off The Grid? KISS = Keep It Stupid Simple! Start by writing a story. Describe your vision of what living off the grid would mean for you. Keep it simple: Start with the basics. You can always expand your ideas later. Why do you want to get off the grid? What do you want to accomplish? Is there a problem you think going off the grid will solve? What will your new off the grid homestead look like? How do you see yourself in this new lifestyle? When do you want to get off the grid? Where do you want to live off the grid? 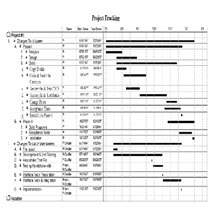 Keep in mind that a complex idea at the outset may later become an overwhelming project to complete. 2: Need To Plan To Get Off The Grid? Develop A Road-map! Once you have your story written, it does not become cast in stone; it can, and likely will, change as you progress and learn more. However, the core of your story, how you describe your vision for your life off the grid, should essentially stay the same; only the details may change. ​From your story, you must develop a plan: A road-map to follow so that you can bring things together in a logical order. This is how you will find out what things need to be done first in order to do what comes next. This is how you avoid costly mistakes, frustration and possible heartbreak. 3: Need Money To Get Off The Grid? Be Debt Free And Budget! 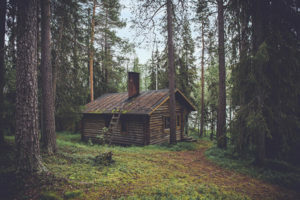 The beauty of living off the grid, out of the system, is that, once you've established your off the grid homestead, your cost of living could become a lot less but that's not guaranteed. Depends on how you setup your homestead. Truth is that "there ain't no free lunch!" It does take money upfront to get off the grid. However, you could likely save money in the long run. 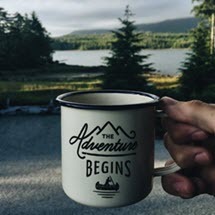 Ideally, start out as debt-free as possible and work against a budget for your adventure so that you know where you stand financially as you progress towards becoming self-sufficient in living off the grid. 4: Need Land To Get Off The Grid? Land That Supports The Lifestyle! 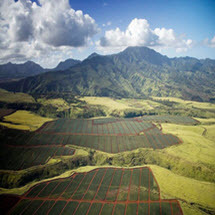 You will need to find land that will support your new off the grid lifestyle based upon your story, your vision-quest. Apart from defining where you would like to live off the grid, your story should also define how you hope to achieve self-sufficiency. Are you going to include chickens? What about other animals - pigs, rabbits? Are you going to grow vegetables? Are you intending to produce enough stuff to be able to use some in trade? All of these factors will help determine the type and size of the property you will need. 5: Need Water To Get Off The Grid? Water Supports All Forms Of Life! Wherever you choose to get off the grid, you absolutely must have a dependable source of drinkable water. 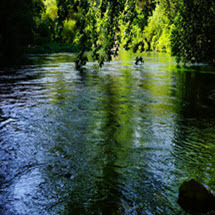 Water Rights are absolutely critical to your success in getting off the grid and water rights are also, most often, a source of contention. Be sure to check into what your rights would be for accessing and drawing water on your property in your chosen location. Without water, you cannot survive, your chickens and any animals you may have cannot survive, your vegetables cannot survive! 6: Need Shelter To Get Off The Grid? 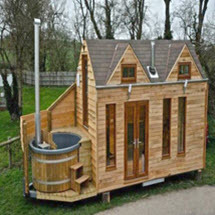 A Tiny Home, A Yurt Or A House! Wherever you are going to live off the grid, you will need to have some form of shelter; a home. You can build your off the grid home from scratch or you may be lucky enough to find land with a home already built. There are many different types of construction that you can choose if you decide to build your own home. 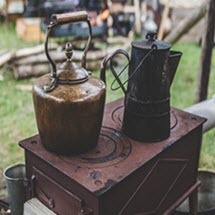 For example, you could start out living in a Yurt or a Tiny Home to keep your initial investment down and live there while you construct your future homestead house. 7: Need Food To Get Off The Grid? Beef, Chickens, Pigs, Vegetables, Rabbits! You can decide that growing your own food is way too much trouble and keep relying on the Super-Market or on the Farmers Market for your food. But, to become self-sufficient, you will need to consider growing at least the critical portion of your own food. That could include chickens for meat and eggs but also for a source of income. You could include a small herd of beef cattle, obviously for meat but also for income. Vegetables are important, rabbits and pigs add to food and income. 8: Need Heat To Get Off The Grid? Personal Warmth, Welfare And Cooking! Few experiences in life are more miserable than being without a source of heat in the cold for any length of time. In fact, hypothermia, extreme lack of heat, can quickly kill you. But you also need heat for cooking food. Many options available today for warming yourself, your home, your water and for cooking apart from a traditional wood burning stove. For example, for your home, yourself and your water, you could use Solar or Geo-Thermal sources of energy. Cooking could be done using Bio-Gass. 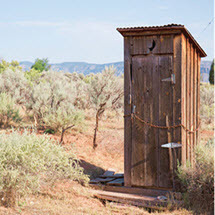 9: Need Sanitation To Get Off The Grid? Must Dispose Of Human Waste Safely! If you do not connect to a public utility sewage system, you must create a way to safely handle human waste. You could build a carefully positioned out-house away from any source of drinking water or create a septic system and/or use a composting toilet. Handle Gray water separately. 10: Need Electricity To Get Off The Grid? Not Really, But It Helps! 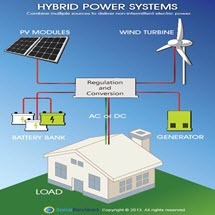 Many folks have successfully lived for years completely off the power grid and even without any source of electricity. However, as long as we do not have a TEOTWAWKI situation, why not use the available technology? Going from living fully on the grid to fully off the grid is a challenging thing for most people to do: It's a huge change in lifestyle. With so much of our modern day life supported by things that require a source of electricity to function, why not ease the burden of change by adding the systems to create your own sources of electricity? 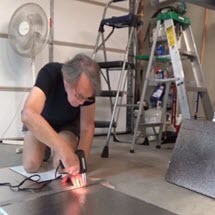 11: Need DIY Skills To Get Off The Grid? Absolutely, Unless You Hire Help! As I said above, going from living fully on the grid to fully off the grid is a challenging thing for most people to do. It cannot be stressed enough that this is a radical change in lifestyle but it does have many advantages in the long run. It is easy to call in a plumber or a handy man to fix things in the conventional urban/suburban home. Most things in the typical home do not require any serious DIY skills. However, that is completely opposite of living off the grid. You have to be your own DIY handy-man/woman. If money is plentiful, you could hire help, otherwise you are your own plumber, carpenter, roofer, gardener, farmer, etc..
Now Are You Ready To Live Off The Grid? Do you now know what to do? Where to start and how to start doing that? Do you want to learn and get help on how to do that? Would you enjoy being part of a Community of like-minded folks getting off the grid together and helping each other solve problems and answer practical questions? If you have not already done so, sign up now to register to join, and become a part of, the "How To Live Off The Grid Now" Community Academy/Forum by Clicking here to register to get all the benefits of membership. Do not let the above graphic scare you. This is just a representation of all of the possible ways in which you could, if you really wanted to, become completely self-sufficient and self-reliant. But you do not need to do, or use, every option shown: You can choose to adopt only those options that work for you and meet your needs. You Can Spend Days Searching For Info; Why Waste Your Time? There is a veritable forest of information freely available on the internet. You can easily spend days wandering through the maze of data sorting out the few good, helpful nuggets of information from a vast pile of often misleading and incomplete stuff. Or, you could possibly save yourself a bundle of time, money, effort, frustration and even, perhaps, failure and heartbreak. You could do that by joining, and participating in, our growing Community of folks living, or getting to live, off the grid. Click here to register to join now. If you are reading this on the Blog Post, please scroll down and leave a comment below to share your own thoughts and feedback here otherwise, please go to the Blog Post and leave your feedback there. I read them all. Neither How To Live Off The Grid Now™, The Business Builder's Help Desk™ nor MISSI provides Legal, Financial, Accounting, Real Estate, Investment or Property Management advice or services. 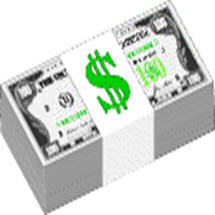 See links in the page footer section to the Business Policies for more detail. All content herein is provided without warranty or guarantee of any kind and is presented herein solely as a "How To Live Off The Grid", topics relevant and curated, resource for community development of general educational and informational review, research, discussion and debate. We are open to, and invite, constructive comments and feedback.